This fly catches fish all through the season and is again relatively simple to tie. It was this fly that took the best bag on both days for my team, the Northumbrian Badgers, in the 1993 Benson & Hedges International final on Rutland water. It is also a tremendous fly in the north. The method is to cast to the side of the boat 10-15yds. Then give a long draw and hold. This is a dry nymph that fishes in the surface film. Keep everything very delicate when using this fly. Hook : Size 12 to 16 . Silk : Beige Uni-thread 8/0. Tail : Three strands of dirty green goose tail feathers. Body : Green goose feather quill fibres. Rib : Fine green wire. 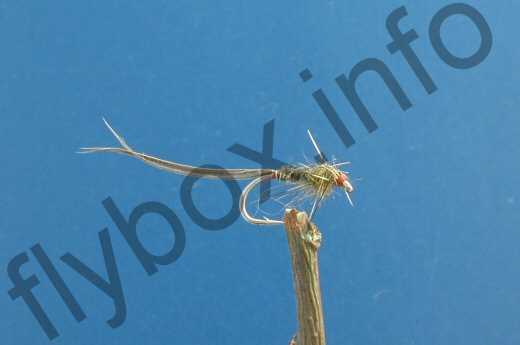 Currently there are no comments about the Little Green Dry Nymph fly pattern from other fly fishermen yet.